We're sorry, all of our customer service team is busy. Your comments are important to us. Please leave a message and we'll get back to you. Please hold. Please remain on the line. I've been fortunate enough to visit the Aloha State, and when in Honolulu I made the trip out to Pearl Harbor and the USS Arizona memorial. It's probably a place everyone should go when on the Islands. It's a somber place-understated but a dignified monument for those that died on 7 December. One thing I would be interested in, though, is what was on radio and television on December 7, 1951. I expect it wasn't full of memoirs and retrospectives on what happened ten years previous. Actually, I suppose I Love Lucy was on the tube, Gunsmoke was on the radio, and the news was all about the direct-to-video sequel to WWII-the Korean War. Point is, Americans probably remembered Pearl Harbor on that day-and moved on with their lives. I'm not sure we're doing so well with the 10th anniversary of the September 11, 2001, attacks. Tomorrow will see almost every channel on TV showing retrospectives of the day. The History Channel is even having a special to be shown on all of their channels all over the world. The rest of the world will probably think a) we're a nation of people who can't cope with adversity or b) won't care or c) both. I realize there is an exponential increase in mass media since the mid-20th Century, and September 11 will be, at least for Americans, a 'remember where you were' day, much like the day President Kennedy was shot, or the Challenger exploded, or the night the Berlin Wall cracked open (I remember watching the news the night the Berlin Wall opened up and thinking 'Well, that was easy'.). That's, I think, fair enough. But shows featuring the final phone calls and messages of the people who died that day seems to me to be in poor taste and somehow in my opinion cheapens the meaning of the day. Those messages really should have been kept private. And how many times do we really need to see those planes crashing into the World Trade Center? There was that day, like in any another disaster, the whole range of human nature. There were some outstanding examples of heroism and valor along with I'm sure panic and cowardice. We remember the acts of firefighters, police, and ordinary citizens, who went into places most people were trying to get out of. A lot of them didn't survive the day. We remember those people on Flight 93 who chose to fight back instead of dying in fear. They died anyway, but far better to go down taking a swing if there's no real choice. We remember all the good people who've died since then in the various conflicts. At the same time, Americans need to move on. There are a lot of issues we need to try to tackle and solve. The current administration seems to want to wind down our foreign adventures, and it's probably time. We've captured or otherwise dispatched most of the brains behind the plot. That the main plotter of the events of September 11 is currently fish food is adequate revenge for me. Paid in full. Perhaps the fish that nibbled on the body of Osama bin Ladin will get caught and provide a day's nourishment for some family-proof that some good is present in all men, I suppose. Anyway, let's get our troops back here. I dare say we could use them around the southern borders of our tired old Republic. Much to do, everyone, in this nation and world. Remember our fallen, but move on. The people that died on 9/11 would want us to do that, I think. Let's roll! Well. Been a while since last I showed up here. Been a lot of stuff I suppose worth writing about-a debt deal by the government which really isn't much of a deal; the fall of Tripoli and Qaddafi's regime in Libya-good riddance to bad rubbish; the incoming NFL season (the Bears still haven't improved their offensive line); the looming conclusion of the baseball season (Cubs in 5th in the 6 team NL Central-I'm surprised they're that good); the recently concluded International Softball Congress Men's Fastpitch Tournament here in Moline-some good ball played by some talented players from all over the world, and congratulations to the Jarvis Travelers from Ontario for winning the whole thing. Hmm. Since we're on the subject of ballgames, let's discuss that staple of the baseball stadium concession stand-the hot dog. For me, part of the experience of going to the game is having a dog and a cold beer. I suppose if I were in, say, Australia, watching the footy, I'd have to partake of the infamous 'meat pie', which actually would be quite good if made from someone's recipe, in their kitchen, with identifiable ingredients. I shudder to think of its mass-produced counterpart. I actually had a bratwurst at the softball tournament from a stand run by a local meat market. It had real identifiable meat in it and it was to a mass produced bratwurst what a '59 Cadillac is to a Yugo. Outstanding! Now I know that hot dogs are made of basically whatever's left from the animal du jour being killed at the slaughterhouse. They're full of fat, salt, and nitrates-which is why they taste so good. I eat maybe six or seven of the things a year. I know they aren't the best things in the world to build a diet around. But nothing we eat these days escapes the Food Police, those organizations, which I suppose have good intentions, that tell us that anything that has, say, flavor-is going to kill us. And they may be right. But then, life is bad for the heart as well. That has the subtlety of a mallet! 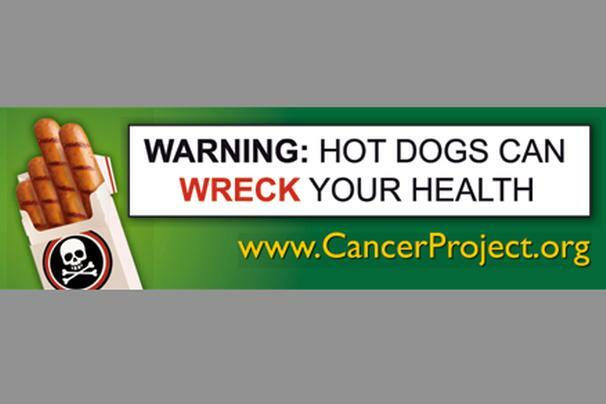 I might be inclined to think that if one were to eat six or seven hot dogs a day-every day-for 20 years-then one might suffer adverse health effects. 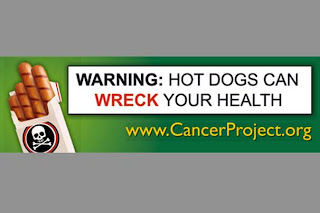 On the other hand, there is probably some 95-year-old guy out there who's eaten hot dogs every day since the end of Prohibition and is healthy as a horse. Who can say? Eat fish-Fish are full of good omega-3 oils and are generally lean and full of protein, and can be prepared in a lot of low-calorie ways. Don't eat fish-Fish absorb a lot of the pollutants that humanity has thoughtfully placed in the world's waterways. Minerals like mercury accumulate in many species of fish. Fish should, therefore, be avoided. Eat eggs-Eggs have a lot of nutrients and protein, and are portable and tasty. Don't eat eggs-Eggs are loaded with cholesterol, which clogs arteries and contributes to heart disease. Eat red meat-Most meat is loaded with vitamins and protein, which helps to make you feel full. Don't eat red meat-Red meat is laced with fat, contains cholesterol, and, depending on how it's prepared, put a strain on the digestive system. Also, beef and pork take a lot of resources to produce. Red meat should be avoided at all costs! Eat poultry- Poultry is generally low in fat, high in protein, and very versatile to cook. A must in your diet! Don't eat poultry-Poultry in high in cholesterol and generally produced in 'inhumane' factory farms. Not to be supported with your purchases! Drink coffee- Coffee has caffeine and seems to have some life-extending chemicals in it. Enjoy a cup! Don't drink coffee-Coffee has caffeine, which can increase heart rate and increase the risk of a heart attack or disease. Stay away from the coffee pot..
Eat vegetables and fruits-Vegetables and fruits are high in fiber, and many contain vital antioxidants for cancer prevention. Don't eat vegetables and fruits-Many vegetables and fruits are grown on huge truck farms and full of pesticides and herbicides. Eat at your own risk! Drink a lot of water-Drink 8 8 oz glasses of water a day to replenish fluid levels and help flush the body's internal workings. Go easy on the water-There have been cases of people literally drowning from taking in too many glasses of water. Also, most municipal water supplies are treated with chlorine and flourides, which can be harmful in large doses. Eat grains and grain products-Grains are loaded with fiber and nutrients and are a good source of energy. Don't eat grains and grain products-Grains are full of carbohydrates, which, if consumed to excess, can lead to diabetes. Give grains a wide berth! Eat sugar-Sugar is a natural sweetening substance, unlike saccharine or aspartame, and is generally preferred over its man-made counterparts. Don't eat sugar-Sugar is a veritable trove of refined carbohydrates, which the pancreas finds hard to produce enough insulin to break down. Can lead to diabetes. Avoid sugar. Eat salt-Salt is a necessary component for the body to function, and has been infused with iodine, also necessary for the body's functions. Don't eat salt-Salt conributes to hypertension, which, if untreated, can lead to heart disease. Put down the salt shaker! There you are. That's easy to follow, isn't it? Sure it is! Enjoy your newfound health and vigor. Bon appetit! So, Borders is finished as a chain. The local store up in Davenport has had a lot of traffic over the past couple of weeks. Actually, our store was always full and ours was one of the few that remained open after the initial filing for bankruptcy, but I think the business volume has doubled. Obviously, a lot of people are looking for bargains. The place is starting to get a definite 'picked-over' look. I've picked up some stuff of interest fairly cheap that I wouldn't have paid full price for. Allen Steele's Coyote series-interstellar colonization in the Heinlein tradition. Not bad, but Heinlein would've wrote it better. The Great War in Africa. Interesting reading about WWI in Africa. Completely different style of fighting than in Europe. Robert Conroy's 1945- not bad alt-hist regarding the US invasion of Japan in 1945-46. Robopocalypse. Don't waste your money on this-either watch the Terminator series or read World War Z which is much more masterfully crafted. DVDs of the early seasons of The Red Green Show. Obviously people in rural Ontario live just like people in rural Northwest Illinois. Overall, not a terrible bunch of titles. I'm going to miss Borders. I spent a lot of hours in their stores and put more than a little bit of money in their coffers. We still have Barnes & Noble, but a lot of times Borders had a bigger selection of titles to choose from. I guess they were a little bit late to get on the e-book wagon, and they couldn't compete with the colossus that is Amazon.com. Some of the employees have quietly said that perhaps the company had too many chiefs and not enough Indians. If so, some of the chiefs they had might have made some tactical errors in running the business. I grew up going to Waldenbooks, which could be found in nearly any mall in America back in the 1980s. Most of the stores were small by today's standards, but when you grew up in a small town they looked like the Library of Congress. I believe Waldenbooks was absorbed by Borders, so they'll be gone as well. In the 1990s, there used to be a smallish chain called Media Play. They had books, and videos, and music. AND video games. One stop shopping! What a concept! That WAS the place to go come Christmastime. A person could get everything on the Christmas list and be done in a couple of hours. But they got too much into items outside of their core business and they folded in the early 2000s. Oddly enough, some of the small local bookstores are still hanging in there. I don't know how they do it, but they are. It's good to see. I can see the advantages to e-books. They're cheap (after the initial investment in the reader), and they take up NO space. But I still like having an actual book in my hands. There is a campaign going to get Books-A-Million, which appears to be based in the southeastern US, to locate a store here in the present Borders. Yeah, I'll email the company to do that. I think the area could support a store. For some reason we appear to be more literate than the rest of the country or something. Plus, I like having a couple of major chains in the area to keep each other honest, pricewise. We'll see. So long, Borders, and thanks for all the reading! Tonight, a few more pics from Train Festival 2011. The Celebration Belle, our local dinner cruise/tour boat. Of course, nowhere near so old as she might look. In the fall, there's not much better than a cruise upriver, looking at the colors along the bluffs. Yes, that's right. The newest. This 4-4-0 was the mainstay of American railroads from the 1850s into the 1880s. This engine is actually a homebuilt project/replica of the Central Pacific Railroad's Leviathan. The CPRR was the western 'half' of the first transcontinental railroad. The owner did a fantastic job of recreating a piece of Americana. And since it's new, the engine is actually fuel-fired (instead of wood-fired) and has all of the latest safety gear. Leviathan could run on any road in the country. Now all he needs is an old combine car and a coach to complete the set. Not Thomas, but a couple of tank engines. They were quite common around factories, lumbermills, and mines until the advent of diesels. Quite small and handy for working industry. One of the 'stars' of the show was Nickel Plate 765. Officially, a Berkshire class 2-8-4 of the New York, Chicago, and Cincinnati Railroad, built in 1944 by Lima Locomotive Works, Lima, Ohio. 765 had a fairly brief career, hauling freights from 1944 to 1958. The railroad donated the engine to the city of Fort Wayne, Indiana. She sat in a city park, deteriorating away, until the local chapter of the National Railway Historical Society took it upon themselves to restore her to running condition. It took a few years and a pile of cash and labor, but today 765 is a star of the steam engine family. If you grew up on the image of, say, Thomas the Tank Engine, or seeing small engines from the 1800s, it's amazing to realize the immense size of the final generation of steam locomotives. NKP 765 weighs 804,000 pounds (364 tonnes), has a driver diameter of 69 inches (1.75 meters), is over 100 feet (30.7 meters) long, and can cruise along at a leisurely 70 mph (113 km/hr). Not bad for pulling fast freights across the flatlands! Get your ticket at the station for the Rock Island Line." Last weekend saw Train Festival 2011 in Rock Island, complete with various old engines and rolling stock and numerous excursions, both on the railroad and on the Mississippi River. The event seemed to be pretty well attended and well-run. A great time for all of the railroad geeks out there, of which I am at least a junior member of the club. Most of the excursions were run on the rails of the Iowa Interstate Railroad, which is the spiritual of not actual successor of the old Rock Island Railroad. The IAIS runs from Chicago to Omaha on the old Rock Island main line and crosses the Mississippi here in the QCs. IAIS even recognizes their ancestor road by having one of their new GE ES44s done up in a 1950s era 'Rock Island' paint scheme. It's an eye-catcher and a favorite of rail photographers. Iowa Interstate is a 'fan-friendly' railroad, generally amenable to hosting excursions and rail events. They even keep 2 Chinese-built 2-10-2 steam engines on the roster for running steam trains! TBH and I took the train last Saturday for the all-day excursion west approximately 60 miles through Iowa City and turned on the wye west of town. The consist was one of the IAIS steamers, 2 Amtrak diesels, and 13 passenger cars. We rolled across the bridge at the Arsenal over the Mississippi River (sorry-no pics. National security and all that. It's absurd in a million ways, but, hell, I don't wanna give ol' Ahmed any ideas), and soon we were on our way across the farms, fields, and small towns of eastern Iowa at a comfortable 45 mph. For those who haven't heard a steam engine whistle, it has a deep and mellifluous sound not heard on modern-day horns. One need only close their eyes when they hear the old whistle blow and go back in their mind to the days when the train pulling up to the station was a major event for a village or town, bringing goods from far away and passengers leaving and arriving from distant and exotic locales (possibly someplace as far as 25 or 30 miles away!). A big treat when a person's world stretches mostly just to the horizon, I reckon. The trip went well-no problems that I heard about. Everyone on board seemed to have a good time. I've said it before and I'll say it again-travel by rail isn't always the fastest option, but I think it may be the most relaxing. Nothing wrong with a nice, roomy coach seat and a drink and just taking everything in. Kudos to the Iowa Interstate crews and Friends of the 261 for work well done! When the Iowa Interstate started up in the late 1980s, it ran over the Rock Island main line west from Chicago. The Rock was in sad financial shape for years and had let the physical plant (equipment and roadbed) deteriorate to the point where 15 mph was about as fast as could be run without risking a major derailment. The Rock went bankrupt in 1980 and the track lay abandoned for a number of years. A group of investors, led by a former Conrail manager, Henry Posner, looked at the traffic that was available and could be scraped up, took a chance and created the IAIS. At first, they ran with a hodgepodge of equipment, and none too fast. (Aside within an aside-there used to be a dinner train here in the late 1980s-the Quad City Rocket. I had the pleasure of having dinner aboard her once. Over the track in the condition it was in at that time, the experience was akin to eating on the pitching mess deck of a small ship in a storm.) Over the years, with wise spending and some loans from government and private entities, the ownership group got the roads fixed, new motive power, new service facilities, and a lot of new accounts for moving industrial and agricultural goods along the line. A real business success story, which should be studied by some of the current shlups running businesses (and government) in this country. We're sitting in our coach on the way back to Rock Island when this thin guy in overalls and a jacket, looking like the guy in the painting American Gothic, walks into the car and introduces himself. None other than Chairman Posner Himself! Cool! He looked like he'd just got done with a turn at the throttle of the steam engine, and maybe he did-it IS his locomotive, after all. He welcomed us aboard, told us a bit about the condition of the railroad when his group bought it, and told us to be safe when waiting to shoot the runby. Actually, he pleasantly told us not to screw up or screw around on his railroad. I can accept that. Railroads are dangerous places to be hanging around. Liability insurance for excursions is expensive, and IAIS doesn't HAVE to sponsor them. Also, running essentially a non-revenue passenger train does divert people and resources from making money moving freight. I also know from what I've read that Mr. Posner is something of a railfan at heart. He likes trains and is aware of how the rails helped form the nation. And hosting these events and excursions is good publicity for the company and fosters goodwill between the railroad and communities along the line. IAIS keeps their right-of-way, facilities, and motive power clean and well-maintained. Some of the bigger roads could do well to follow their example. It looks like everyone from the Chairman down to the guy wielding the hammer takes pride in their work-and it shows. A long ramble-but impressive to me that there are still a few businesses that are trying to do things 'the right way'. Anyway, an outstanding trip. I hope we can pull out another one again soon. Oh, yes. Of course. You can see the runby and the column of smoke and hear the chuffing of the cylinders and the clicking of the drivers simply by going here. Enjoy! with a lot of help from Wikipedia's article. Aluminum Overcast is the Exprimental Aviation Association's B-17 Flying Fortress. She visited the QCs a couple of Saturdays ago. Technically, the plane is a B-17G-105-VE, serial number 44-85740, built by the Vega Division of Lockheed (!-think of GM building Ford's cars). This particular plane never served in combat, having been built in May 1945. 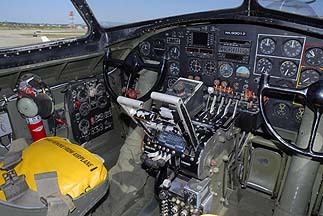 Most flying examples of the B-17 still existing were planes that either served as trainers in the States or built and moved to surplus. However, this plane was bought by a private citizen, who used it as a mapping plane, so the Overcast had a very interesting career mapping the remote corners of the world. In the late 1970s, the Fort was bought and restored to a wartime appearance, mostly by veterans of the old 398th Bomb Group. The plane has nearly a million hours of flight time, the leader among the surviving Forts. Today, the EAA flies Aluminum Overcast to around 60 cities every summer. An enthusiast can even take a flight in her, if said enthusiast has a spare $465. Worth every penny if you're into historic aviation-there are only ten of these still flying. Fortunately, there are several more in museums around the world. The fellow in the pith helmet is I believe the owner of this classic WWII era Jeep, all resplendent with a major general's plate. The windshield frame bears the slogan 'HUMVEE RECOVERY UNIT'. You go, Jeep! This model dates from the Korean War era, and Jeep made them like this for us civilians well into the 1980s. This bad boy sports the colors of the 45th 'Thunderbird' Infantry Division (Oklahoma National Guard), one of two National Guard divisions activated for the Korean War, and still exists today as 45th Infantry Brigade (Oklahoma). Someone around here has a Jeep with a .30 caliber machine gun on a pedestal mount. I saw it in the 4th of July parade. I'd drive that-and I bet I'd get a good parking spot wherever I went! Love the B-17. It has elegant lines not seen on the other major Allied heavy bomber types (B-24 Liberator, B-29 Superfortress, Lancaster), though the old Liberator jockeys at least will give an argument over which plane was the better of the two, and I suppose the surviving British, Canadian, and Australian Lancaster crewmen will argue for the British bird. They're all at this point great to see still flying. As you can see from several of the photos, there was a line approximately the length of a communist-era bread line to tour the interior of the B-17. I decided that waiting an hour in the Midwest sun wasn't going to happen, so I pulled a photo of the cockpit of the Collings Foundation's B-17, Nine-O-Nine, to give an idea of what the interior of those old warbirds looked like. Close quarters-but then so is the main office of a B-52. A nice bit of aviation and military history to see. Keep 'em flying! Travel theme. Theme images by adamkaz. Powered by Blogger.